Knights of Creativity Spirit & Ale: Get Your Fest On! 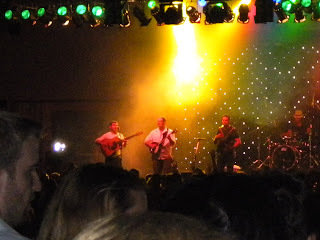 Last night my family attended the Dublin Irish Festival in Dublin, Ohio. 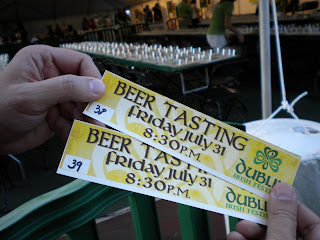 This festival has been a tradition in Dublin for over twenty years and a tradition for my husband and I for three. This was the first year we took our daughters. This is a really wonderful festival, featuring traditional Irish crafts and storytelling, food, dance, and of course, music and beer. Of course, before we left the historic village I had to visit with the woman who was spinning yarn on a spindle and discussing spinning and knitting. As knitting is a passion of mine and spinning is something I've always wanted to try, this was of particular interest to me. 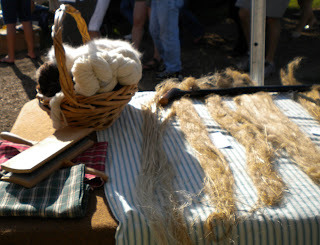 One of the yarns pictured in the basket is actually spun from dog hair. As the owner of a Golden Retriever who probably sheds a sweater's worth of yarn a month, I may need to read up a little bit on that. 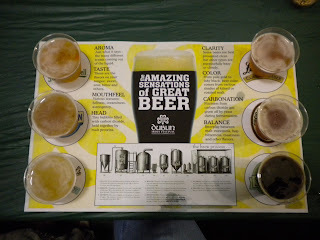 One of the high points of the evening was the beer tasting. 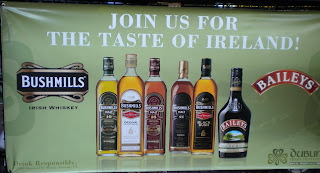 They held a whiskey tasting as well, but we were too late to register for that. We dropped the kids off in a teen zone, where they played Guitar Hero on a screen the size of a bus. My eldest came away with a ridiculous amount of swag. She can rock her some Guitar Hero. 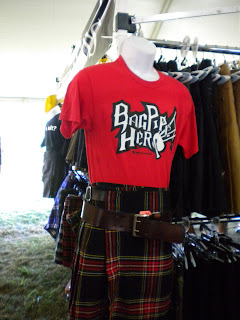 Bagpipe Hero would've been more authentic. And more fun to watch. But you wanted to hear about the beer. After the tasting, on to the show. 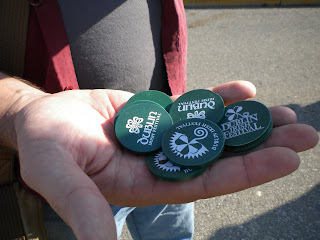 The reason my husband, Tom, and I return to the Irish Festival year after year. The Prodigals. We first heard The Prodigals in 1999 at the Folk Festival in Johnstown PA. We were immediately taken with their fresh, high energy show and their unique sound. They've titled their particular genre 'Jig Punk'. I suppose that works as well as anything. The band has undergone some changes in the past ten years (haven't we all), but they still put on a great show and attract a huge following. The music itself relies heavily on button accordian and bass guitar - an anomaly in the world of guitar-driven rock. They utilize traditional Irish lyrics set to a punk/rock beat. The effect is unusual and really cool. With new knowledge in our brains, beer in our bellies and music in our souls we headed for home. An evening well spent. Welcome to the blog as an official Author, Lady Tammy! Excellent first run! I originally had scheduled to be at the festival myself; however, I had to bump up my meetings to the weekend before...which was chaos because I had just returned from England. Next year! So thank you for sharing a most interesting event. I often wondered why Dublin doesn't have this festival around St. Patty's Day...but then again I forget how much the Irish like to have cause for celebration. Being married to a 100% Irish Lass myself...I really enjoy digging into the Celtic Culture. But then again, we're all probably Celtic to some degree...English, German, French, Scottish, Welsh, Eastern European, etc. Thanks for the links to the Prodigals. I look forward to your post in the future! It would be too cold in March! And why compete? This sets up a whole 'nother party and a whole 'nother excuse to break out the kilts! "One of the yarns pictured in the basket is actually spun from dog hair. As the owner of a Golden Retriever who probably sheds a sweater's worth of yarn a month, I may need to read up a little bit on that." My wife and her mother have talked about this before. They used to have a samoyed who's hair they gave to someone to spin. Never got done. W's parents now have an aging Golden Retriever who sheds a small puppy every day that they have considered. Same talk of getting yarn made. But probably no action will be taken. I'd like to hear your results. And if you're interested in a circa 1857 large loom, I know where you can get one. The mother-in-law has one sitting in her garage for sale. That was downright educational. I so love that you have a camera with you at all times! I like to think. I like to be merry. But I don't drink. Can I still hang around here? Beautiful writing (as usual) mommakin! Methinks thou art a lady of fine bloggage. Tammy Howard, shouldst thou be in the thought of changing thou namest to Lady Tammy of Howard whenst thou be writing thy post for this blog? Your folk festival sounds delightfully delightful. The SCA puts on demonstrations such as candle making, knitting, iron work at our annual renaissance faire. You'd love it. Well, I love it. Welcome All! Unity through Diversity! Alcohol is optional! We need more Ladies of the Realm and their wit and wisdom! Just pick your name and join our Merry Band! whoah nice Blog Lady Tammy. The KMSA bar moves ever higher, Is that the sound of Bowie and Hooky arranging a road trip to Dublin for one of those Beer tasting Mats , I hear. Beer Mat added to my list. Also, a new KMSA T-Shirt that list the Pubs and Beers we visited and drank on our English Tour on the back. I'm so excited to see our boundaries expanding! I'm so exited to be a part of it all! Woo and might I add a hearty hoo! 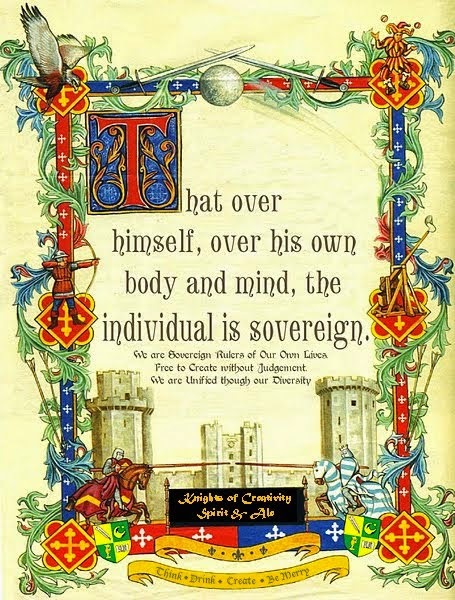 Lady T if you mean KMSA Merch...hold your horses on that a a mo...as i have just this second sent Hooky and Bowie a new version of the Heraldry, where i have tweeked the wording on the motto, re a discussion we had in the Crown and Sceptre in the UK. we'll let you all know when we are finally happy with it. Sir Dayvd ( Think.Drink.Be Merry ) of you know where by now. I the Riley half of Kuhn/Riley in me would love this event. Oh, let's face it, the Kuhn side of me would love it, too. Lady Suzanne and I never missed an opportunity to take our girls to "fests" and such. Sir Dayvd, I only ASKED if "be" should be "Be." I'm such a trouble maker! Lady Tammy! I too was excited when I read your blog! Sounds like a great place to be. 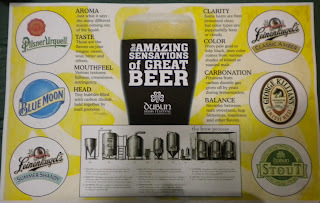 I have been up to Dublin with Sir Hook of Warrick on business and love Dublin, OH too. I think we should all meet at this fest next year to Think, Drink, and Be Merry! 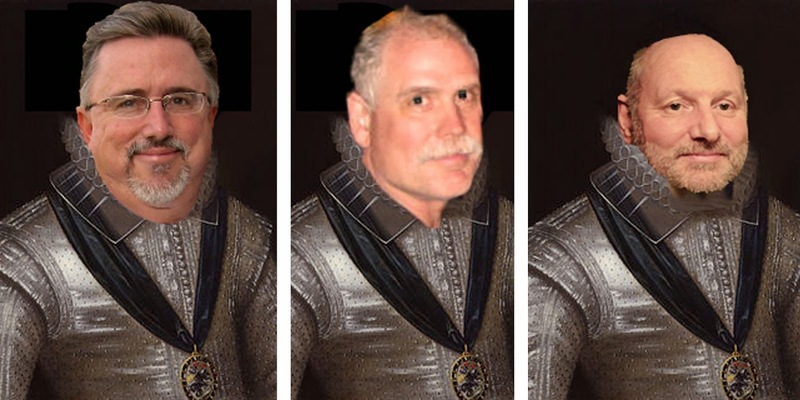 How about it Knights and Ladies! Please let us know when the festival is next year. thanks for such a great review of the festival for us arm-chair travelers!